THE LATEST UEFA CHAMPIONS LEAGUE NEWS – Portuguese hosts Braga left English visitors Manchester United trailing for the first 40 minutes of their Champions League game on Wednesday, but a trio of goals in the space of 10 minutes before stoppage time lifted The Red Devils to another three points. After an empty first half, Alan threatened to win with ease against United with a successful penalty at the start of the second half. 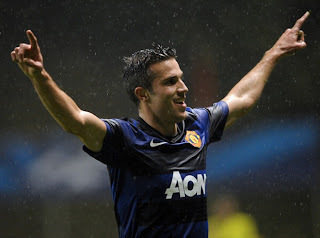 Robin van Persie, who replaced Danny Welbeck, found the back of the net on the 80th minute to equalize. Nuno Coelho’s unfair challenge against Wayne Rooney enabled the England striker to take an 85th-minute penalty that he took for himself to score. Javier “Chicharito” Hernandez rallied towards the end by beating keeper Beto’s woodwork defence.